Bacon makes any vegetarian dish better. Serious question: doesn’t all that give you gas? Is there a recipe associated with this, or did you just throw it together? I kind of threw it together. When I first started the plan, I was using a recipe from the book for ranch dressing that uses silken tofu as the creamy element. Over time, I dropped the dressing and now I eat the salads I make dry or elsewhere I just put vinegar on. 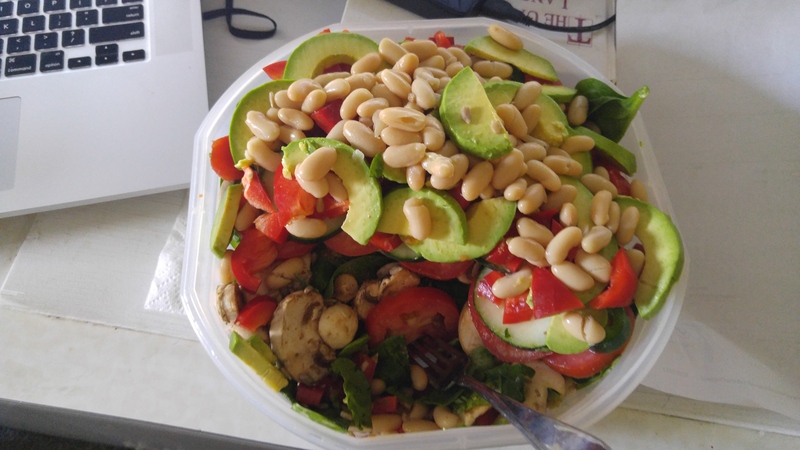 This salad is a 1 lb bag of spinach from Kroger, 1 bell pepper diced, 1/2 a cucumber, 3 roma tomatoes sliced (roma because they are kind of oblong and easier to deal with), 1 carrot sliced, 1 8 oz box of pre-sliced mushrooms, 1 tbsp of flax seed, a few tbsp of raw unsalted sunflowers, 1 jalapeño sliced (seeds left in), 1 avocado sliced, and 1 can of cannellini beans. And that is 1 meal?